The SQL Server CTE, also called Common Table Expressions in Sql Server. This is used to generate a temporary named set (like a temporary table) that exists for the duration of a query. We can define this CTE within the execution scope of a single SELECT, INSERT, DELETE, or UPDATE statement. Expression_Name: Please specify a valid and unique name to the Common Table Expressions that you want to create. It must be different from any other CTE name defined in the same WITH. The Sql Server CTE must be followed by a single SELECT, INSERT, DELETE, or UPDATE statement that use all or some of the CTE columns. Using UNION, UNION ALL, INTERSECT, or EXCEPT we can define the multiple CTE definition. We cannot reference the tables on a remote server. INTO, FOR BROWSE, and OPTION clause with query hint. 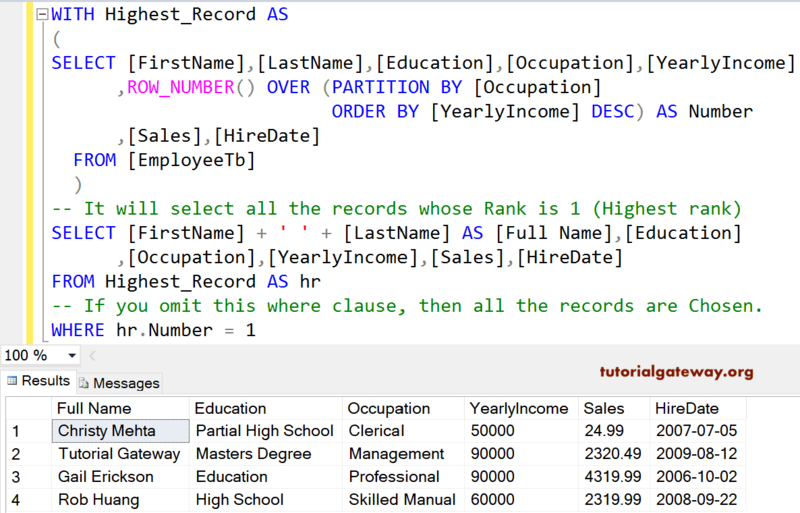 In this article, we will show you, How to write a CTE in SQL Server with an example. 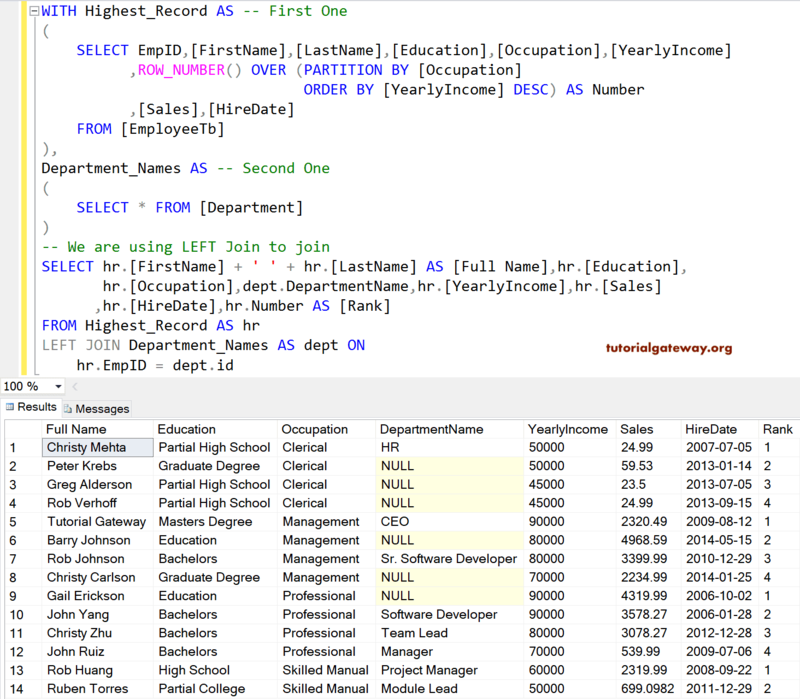 For this SQL Common Table Expressions demonstration, We are going to use [Employee table] and [Department] table present in our [SQL Tutorial] Database. And [Department] table have eight records. In this simple example, we will show you, How to write a simple CTE in SQL Server. 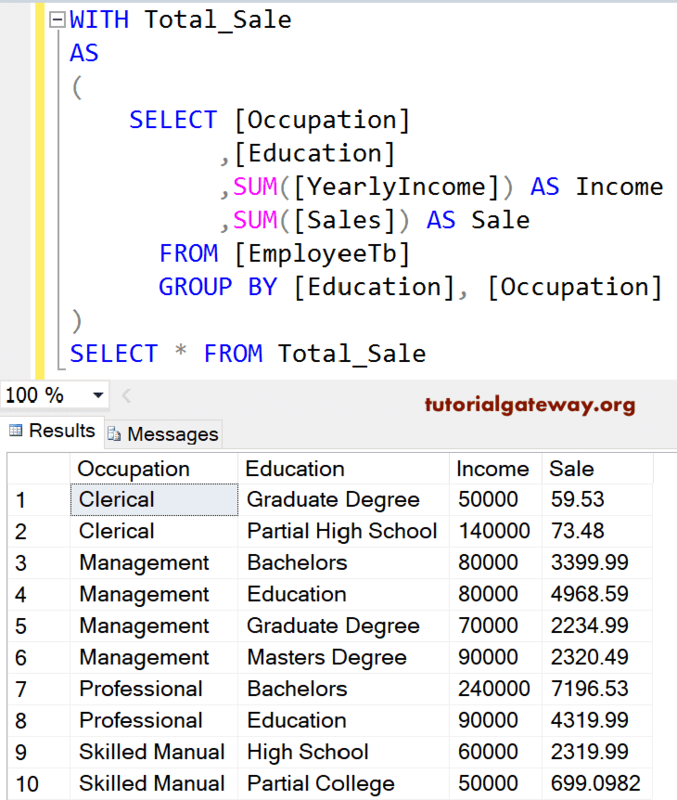 Within this Sql Server CTE we are performing the Aggregations (SUM) on Numeric Columns (Yearly Income, and Sales) by Grouping Occupation, and Education. I suggest you refer GROUP BY Clause article to understand the grouping concept. It is always good practice to add Columns names to CTE because SQL will not throw any error even if you are using duplicate names inside your CTE Definition, or not giving any name to the column. 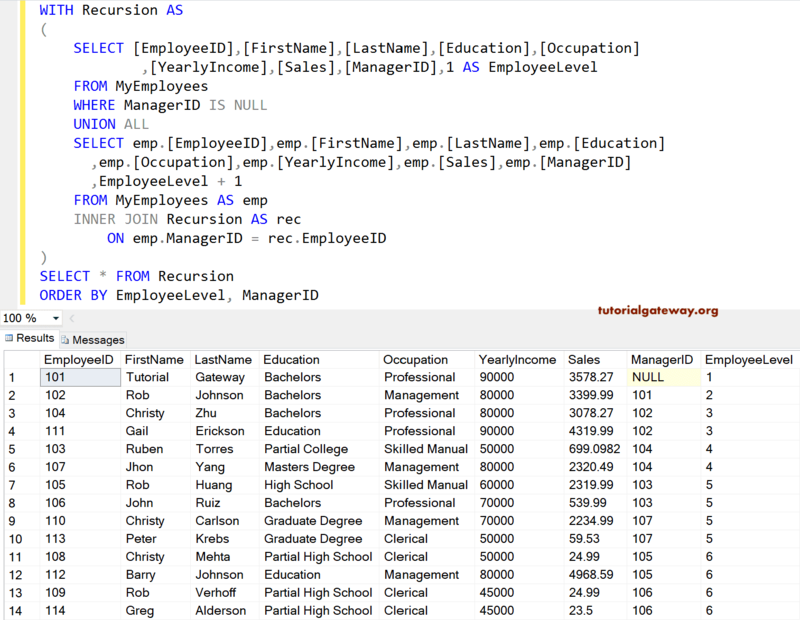 In this simple example, we will show you, How to add column names to SQL CTE. If you are not using the Column Names then SQL Server will throw an error for the following two statements because they don’t have Alias column names. 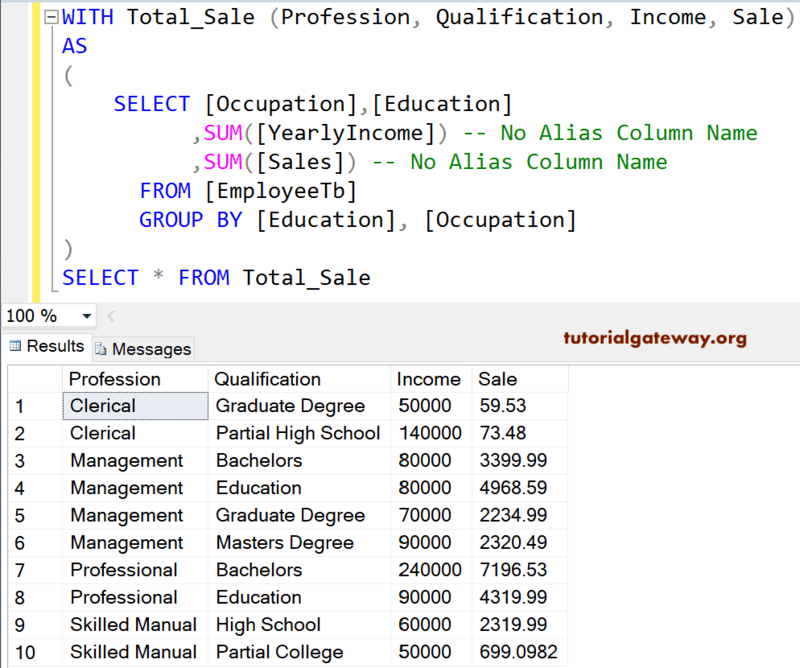 So, CTE in SQL will assign Income and Sale as their Column names. In this simple example, we will show you, How to select the First row in each group using CTE in SQL Server. -- If you omit this where clause then all the records from CTE are selected. The following statement will assign unique row numbers to each and every row present in the Employee table. Please refer ROW_NUMBER and ORDER BY Clause to understand the below query. In this simple example, we will show you, How to use Sql Server Multiple CTE in one WITH statement. As we said earlier, we can write multiple CTE statements in one WITH statement by separating them with Comma. TIP: Please refer LEFT JOIN to understand the left outer join. The recursive common table expressions must contain at least two CTE query Definitions, a recursive member, and an anchor member. You can use any of the Set operators: UNION, UNION ALL, EXCEPT, or INTERSECT to combine the anchor members. UNION ALL operator is the only operator used for combining multiple recursive members. The number of columns and the data types should be the same in the anchor and recursive members. 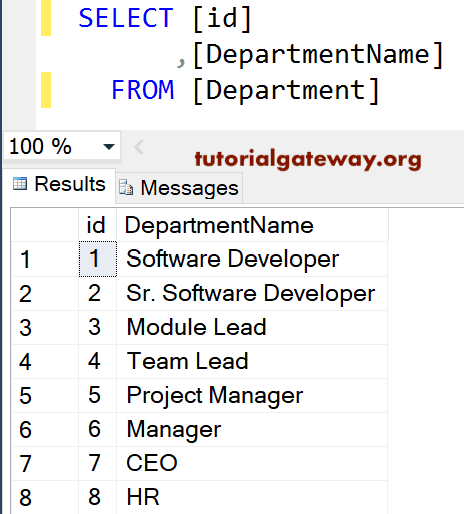 You cannot use GROUP BY, SELECT DISTINCT, PIVOT, HAVING, TOP, LEFT JOIN, RIGHT JOIN, OUTER JOIN, Subqueries, and Scalar Aggregations inside the recursive members CTE Definition. 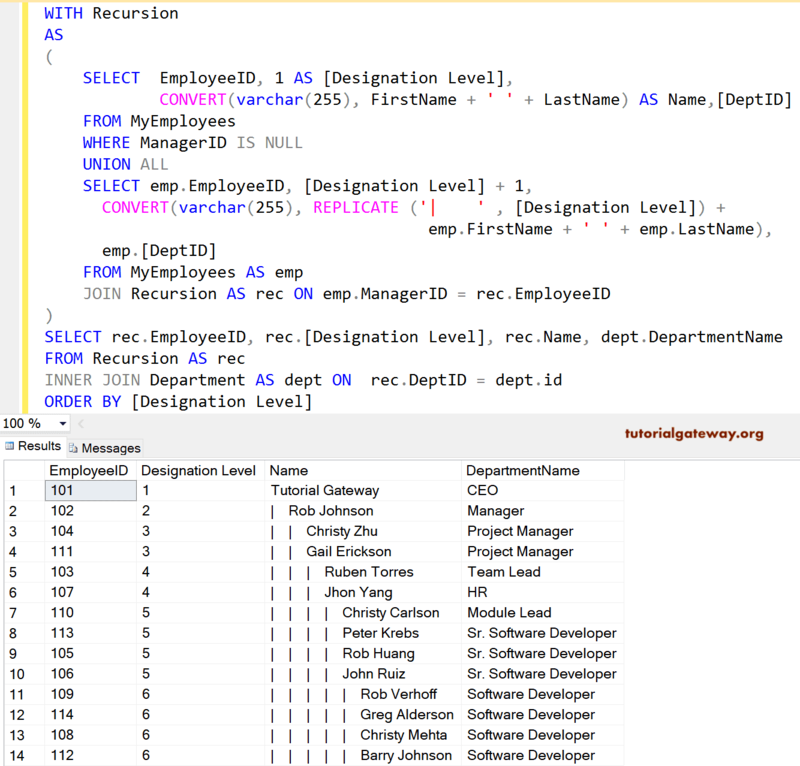 In this example, we will show you, How to write a Recursive CTE in SQL Server with an example. 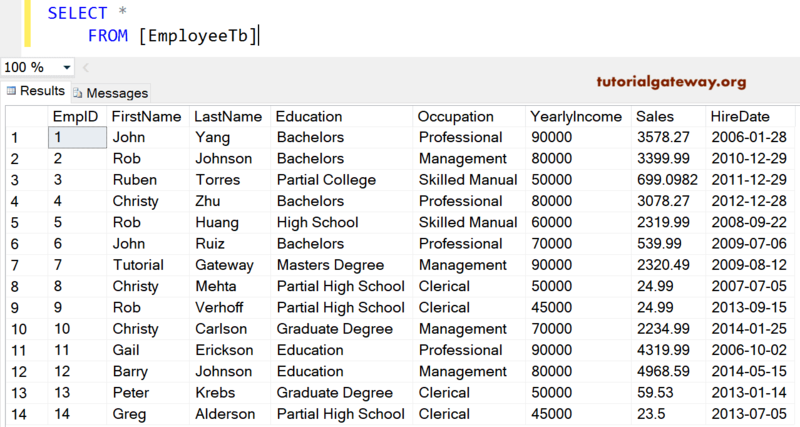 For this demonstration, We are going to use [Employee table] table present in our [SQL Tutorial] Database. In this example also, we are using the SQL recursive CTE. However, this time we are going to modify the above example to show the hierarchical level visually.